Today we’re going to look at a tool you may find extremely useful when it comes to evaluating your business’ products and offerings. Nobody wants to be spending their energy (and worse, marketing budget) on something that is destined to fail. The BCG matrix was developed in 1970 by Bruce D Henderson at the Boston Consulting Group. The idea of the matrix is to help businesses identify where their core products and services fall in terms of the market and ultimately, how profitable they will be. 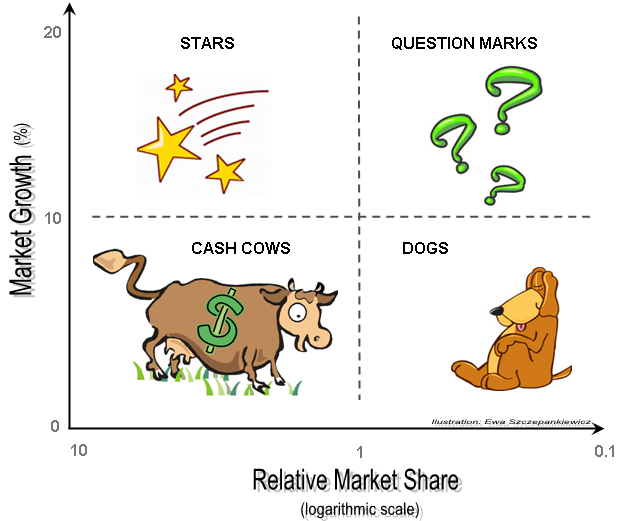 This matrix breaks your products and services into 4 basic categories; stars, cash cows, question marks and dogs. Let’s go over what each of these categories mean using McDonald’s as an example here to simplify it. These are your premium products. For McDonald’s, that would be their Quarter Pounders, The Big Mac, their big “showman” products. These products absolutely dominate the market in terms of the market share and there is room for the market to continue to grow at a rapid pace. Your cash cow products are your core money makers. They’re in that steady, comfortable space where you can continue to milk them with as little investment as possible and still guarantee a steady income each month. These are your products that dominate a slow growing, steady or mature market. For McDonalds, we’re looking at their cheeseburgers or simple hamburgers. These are the products you need to pay attention to. These are the products you could get rid of, they don’t currently own a large share in the market, but they have enormous potential for growth. These are the sorts of products you will need to spend some more time on to turn them into a cash cow or a star. This is where a carefully targeted marketing plan could be extremely valuable. You need a way to make your customers see that your product is different and deserves their money. The McDonalds question mark would be something like their new(ish) “fancy” range. You can get a damn fine burger at a million other places and historically McDonalds has not tried to pander to the portion of the market that would choose fancy burgers – that part of the market has always been incredibly saturated. They have always been about cheap, simple food, as fast as possible. However, because McDonalds dominates the market when it comes to fast food and there is an increasing demand for “fancy” food (I’m looking at you hipsters and foodies! ), there is potential for their new fancy range to succeed – they can appeal to that cross over in the market who don’t want a “Maccas burger” but appreciates not having to wait long for it. It’s going to take a lot of marketing and PR to break through, but if it works, this new fancy range will be the cream on top when it comes to their profits. If your product fits in to the dog category, it’s got to go. This is the product that is draining your resources and not providing any return. This is a product that has no potential for growth and sits in a market that is completely saturated. If you can’t reimagine it to get it back into another part of the matrix, get rid of it. It’s never going to make you money; divert that money and energy into your cash cows, question marks and stars. For McDonalds, this is the Filet-o-Fish. Nobody wants it and the fish and chips shops will always do it better; get rid of it. While this is an extremely simplistic matrix approach, it will allow you to quickly and easily see where your products are performing so that you know where you might want to add some funds or cut products out.